Trending Bedroom Remodel Inspiration What do you think of when you think of your bedroom? Is it simply somewhere to sleep and store your clothes? Are you surrounded by four boring walls that haven’t changed since you moved in!? How about your sanctuary, your happy place...that place you can’t wait to get home to at the end of a long day. If your bedroom doesn’t inspire the latter, you might be past due for a bedroom remodel. There are many different interior design themes you can choose from that will transform any lackluster space into a beautiful room that you can’t wait to get home to! A contemporary bedroom remodel will fit into almost any home. For a contemporary interior design theme, choosing light greys and neutral paint colors will make you new space pleasant and relaxing. When shopping for bedroom furniture you can stick with neutrals, or go bold with a few dark pieces when picking out your headboard and nightstands for a little contrast between your walls. Lighting is another key factor when considering a contemporary bedroom remodel; make sure to add a mixture of soft and bright lighting. You can also opt for dimmers so that you can control the lighting depending on your mood. Remember the contemporary design is all about tranquility and simplicity. If you’d prefer more of a luxury remodel, consider a romantic interior design theme. For this bedroom remodel you are going to want to choose darker colors for your accent walls. Going with a shade of dark purple, red or black for your accent wall against a lighter grey will add a glamorous contrast to your bedroom remodel. Darker furniture is also recommended for this type of bedroom remodel, but you can always switch is up with a few light pieces. When it comes to lighting, nothing says luxury remodel like a chandelier over the foot of your bed. Dimmers with soft lighting are also a great touch to the lighting of your romantic interiors. For your pillows and duvet, mixing whites with darks adds a little dimension versus going with all darks. Choose a white duvet and add a few deep purple or red throw pillows and an accent blanket for a luxurious vibe. For the modern interior design remodel, focus on minimalistic everything. Low minimalist design beds with shorter headboards should be the focal point of any modern bedroom remodel. For this bedroom remodel design, you can be pretty flexible with your paint colors; modern bedrooms look great in light neutrals and dark colors. You can also get creative with your accent walls and choose to add wood or vinyl paneling in light greys, tans or even white. For those seeking more of a luxury remodel within the modern theme, try adding plush wall panels to your accent wall for a unique touch of glam. There are countless options when it comes to your bedroom remodel. If you’re not sure where to start, consider getting in touch with a Los Angeles remodel firm to help you with your project. Your bedroom should be your very own private retreat. Get informed on all of your options before you start your bedroom remodel and be confident that you’re going to love the final product! It’s the latest word used to describe the advancements made in modern technology that we use every day. Our smart phones have become an extension of ourselves, containing vital personal and business information. Our cars also contain smart technologies that we use to enhance our driving experience on a day to day basis. Collision prevention systems and blind spot monitoring are just a few of the smart features that add comfort and convenience to modern cars. But what about our homes? Smart home technologies should be at the top of your list when it comes to a home remodel. The added comfort and convenience and the ability to blend in with your interior design make these remodel upgrades a must for your home. Ever leave your home and halfway through your drive forget if you closed the garage door? What about the lights? Or the thermostat? When thinking about your home remodel consider adding remote and Wi-Fi controlled smart devices to your lights, thermostat, garage door opener and even your watering system. These smart remodel features can typically be controlled from your smart phone, tablet or anywhere you can log on to the internet. Security cameras are a remodel upgrade that can offer you piece of mind and security. Whether or not you choose to link your security cameras to a 911 service, you can monitor your home from your smart phone or any device with internet access. Gone are the days of obnoxious, unsightly cameras; many companies offer tiny cameras or cameras that blend in with your existing home décor. Adding solar to your home has been one of the biggest trends in the industry. This home remodel addition will cut your electric bills down to practically nothing and add value to your home. There are various programs available that enable you to roll the costs associated with installing solar into your property taxes over a specified span of time. This enables you to reap the benefits of adding solar now without breaking the bank. Adding speakers and televisions to different areas of your house that blend in with your home décor are an innovative way to add technology during your home remodel. Decorative speakers can be added to both exterior and interior spaces of your home. Advances in televisions include extremely thin designs that are easy to fit into hollowed out spaces creating a seamless look above your indoor or outdoor fireplaces. You can pair your entertainment systems with devices such as Amazon’s Alexa to easily control what you want to see and hear throughout your house with voice commands. The latest smart technology trends can also address issues that occur inside the structure of your home. Installing water leak and mold sensors in your home could potentially save you thousands of dollars in repair costs. These devices can detect leaks while monitoring temperature and humidity changes throughout your house. These systems send the data reports directly to your email or smart phone. These are just a handful of the smart technologies that you can include into your home remodel. Taking advantage of these modern conveniences will add comfort, safety, and value without clashing with the interior design of your home. You’ve finally closed on your dream home, but there might be a few things you have in mind that would make your new home a little dreamier. A bathroom remodel might be just the thing to add your own special touch to your new home. Or maybe you’ve been in your home for years and love it but you’re itching for a change. Should you go with a whole home remodel or simply an interior design facelift? There are so many options when it comes to your home and for those of us who aren’t professionals this can seem like an overwhelming task. You may want to get in touch with a Los Angeles remodel firm to help you get started. Ask yourself some important question and create a plan for your home remodel. This will help set you on the right track, making the home remodel process a little less hectic. First question you should ask yourself, what is important to me and my family? Love to cook? How about a kitchen remodel? Are you tired of your guests seeing that 70’s lime green tile in you bathroom? Maybe it’s time for a bathroom remodel. Thinking about what is most important to you and your family will help ensure that you are satisfied with your home remodel when it is finished. Next big ticket item, budget! This will be your starting point so you’re going to want to figure out your budget early on. It will make the difference between a whole house remodel and something a little more cost friendly such as a few interior design changes. Where will the money be coming from? Will you be taking equity out of your home for your Los Angeles home remodel? Or do you plan on picking the project and pushing your home remodel out to a later date so that you can budget it into your finances? Whichever route you choose, getting your budget squared away from the start is a must! Having a budget in place will help you avoid any unwanted surprises midway through your project. This might be the single most important factor for your home remodel, finding the right contractor. If you’re lucky, a friend or family member will be able to recommend a contractor that they’ve worked with in the past on a home remodel. If you don’t know anyone who has used a contractor recently for their Los Angeles remodel you can utilize search engines and social network sites such as Yelp and Home Advisor to check reviews for various contractors in the area. Always make sure to verify that the contractor you go with for your home remodel is licensed and bonded; you don’t want to end up with someone that could end up doing damage to your home under the disguise of a cheap price. The saying you get what you pay for definitely holds true when it comes to a home remodel. What is going to add the most value to your home? Although you want to upgrade what is the most important to you, it’s also important to think about the future and what type of home remodel is going to add the most value to your home. Obviously some areas of the house will hold more weight when it comes to adding value to your home. A kitchen remodel can add tremendous value to your home especially if your current kitchen looks like it belongs in another decade. Other parts of a home remodel such as adding new energy efficient windows will increase the value of your home while decreasing your heating and cooling bills for many years to come. Updating your central air unit and other old household appliances to new energy efficient models can also help you save thousands on your utility bills. When it comes to your home remodel you can NEVER do enough research. Do you have a neighbor or family member who just completed a bathroom remodel? Make sure to pick their brain on what they did and remember to ask if there was anything they wish they would have known before starting the remodel process. Search engines are also a great tool to utilize while gathering research for your home remodel. There are countless forums available where people who are going through the process or have already completed their home remodel will post and answer questions. The more research you do the less likely you are to run into any surprises. However, things can happen! Be prepared to handle whatever comes your way by being proactive about doing your research. At the end of the day remember to have fun with your home remodel. It doesn’t have to be a painstaking process and once the sound of hammers is gone and the dust has settled you can sit and relish in the results of everything you’ve been planned for. Enjoy! So you’ve been thinking about a bathroom remodel but you don’t really have a clear picture of what you want your updated bathroom to look like. Or maybe you’re leaning more towards a retro style remodel while your partner would prefer a more modern bathroom remodel. If you are in need of some bathroom inspiration it might be a good idea to look up a Los Angeles remodel firm to help point you in the right direction. You can break down your bathroom remodel into a few categories: flooring, shower and bathtubs, sinks and cabinets and lighting, vanity and mirrors. The size of your bathroom is going to be the main determinant in how you handle this part of your bathroom remodel. Do you already have a tub/shower combo? Shower only? Or separate shower and bathtub? If you have the space expanding your glass stand alone shower (even if it’s only a few inches) can make you bathroom feel much more modern. Taller shower glass without those dated gold, chrome or black shower rails are at the top of many bathroom inspiration boards. Regular clear glass is also recommended versus opaque glass to give your shower space a clean finish. If you’re working with a shower/tub combination and don’t want to replace the tub the best way to update you shower is with a new backsplash and updated hardware. Plank and subway tiles come in an array of different colors and make for beautiful shower backsplashes. Make sure that your backsplash isn’t identical to the flooring you choose; you want a slight contract between the two. If you’ve decided to go with a Los Angeles remodel firm they will be able to help you choose a backsplash and flooring combination that compliment each other. Depending on where your bathroom inspiration has taken you, you may or may not choose to update your floors. When it comes to bathroom flooring carpet isn’t going to be the number one recommendation; it can make your bathroom feel dated and there is always a possibility that mold can pop up if you aren’t careful. Waterproof vinyl plank flooring is a perfect update to carpet or old school linoleum flooring. This type of flooring comes in an array of colors so you will be able to get exactly what you want for your bathroom remodel. Another flooring option that looks great in any bathroom is wide plank tile which is also available in many different colors. You can pick up color and texture samples at your local home improvement store. If you choose to go with a Los Angeles remodel firm they may also be able to provide you with a book of samples. An updated sink goes a LONG way. Switching from the traditional round and oval sink types will make your bathroom feel completely different. Choosing a new sink for a bathroom remodel is a must; raised ceramic and glass bowls can give your bathroom a modern Tuscan vibe. These sinks come in many different colors to match your bathroom remodel color scheme. If you don’t want to go for the raised bowl you can change up your boring oval sinks with a square or rectangular sink bowl. This might fit in better with the bathroom inspiration you’re going for. The last item on the list will vary greatly from person to person. You may or may not want to update your mirror but if you are looking for a dramatic overhaul with your bathroom remodel consider changing the shape and size of your mirror. Change your rectangular mirror to a circle or oval mirror and vice versa. This goes the same for vanities; you can choose different shape vanities depending on your style and preferences. Updating your lighting is also recommended for both a full and partial bathroom remodel. If you are changing the hardware of your sinks and showers you may want to update your lighting fixtures to match. Matching doesn’t necessarily mean color; you can choose to fixtures that might not be the same color but they flow with the theme of your bathroom. If your bathroom inspiration has lead you towards a sleek modern look there are plenty of gorgeous minimalist fixtures you can add to your bathroom. If Tuscan is more your style choose deep bronze fixtures with antique style lamps. Still not sure how to make the pages of bathroom inspiration you’ve been scoping out online into a reality? 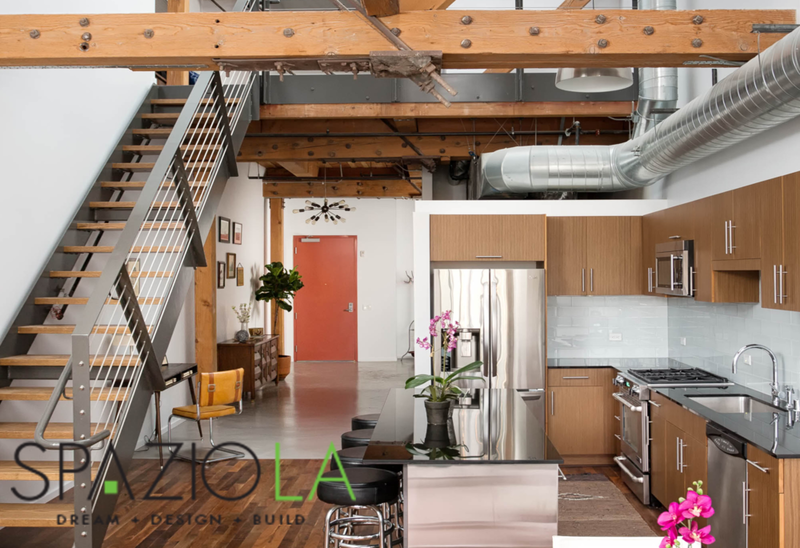 Choose a Los Angeles remodel firm to help make those ideas into a reality! There are so many different avenues you can choose for your bathroom remodel; why not get a professional to help you reach your bathroom inspiration goals? Love your home again - even on a budget! Love your home again - even on a budget! It’s been a few year since you’ve moved into your home; you’re Pinterest page is full of glamorously dreamy homes that make your own interior feel a little lackluster. You would love to revamp your home with a remodel but it really isn’t in the budget at the moment. However, some interior design updates and a few home décor changes are all you need to give your home the feel of a full remodel. The best thing about these interior design updates is that you don’t need to spend thousands in order to create a beautiful space that you’ll love coming home to everyday. One of the easiest ways to dramatically change the look of your home is with a fresh coat of paint. New paint can give your home the fresh look of a whole home remodel without breaking the bank. The best thing about paint is that you can DIY if you want to keep your budget to a minimum. You also don’t need to completely repaint your entire house to spice up your home décor. Simply add a few accent walls for a fresh interior design update. Switching up your window coverings will definitely have your guests taking a double take the next time they enter your home. Switching from curtains to blinds or vice versa will completely change the look of your interior design. If you don’t want a change that dramatic, changing the color scheme or pattern of your curtains will help give your house that fresh remodel vibe. Not everyone has the budget for a complete floor overhaul. Rugs are a budget friendly interior design go-to for floors at a fraction of the cost it would take to re-carpet or tile your home. Another huge plus about rugs is that you instantly get to see your interior design change. All you have to do is drive to your favorite home décor store and haul your new rugs home. No waiting days for tile to be installed or hard wood to be put together. You can add accent rugs and rug runners to your hallways easily and instantly to help transform your home décor. Another interior design must that people often overlook when they remodel their homes are wall hangings and artwork. It is possible to purchase quality artwork that will completely update the feel of your home décor on a budget; you just have to know where to look! Estate sales are a great place to look when you are working with a budget. With a little luck you should be able to come up on a few pieces of a collection at these estate sales. Matching artwork will give your home décor a professional look at a fraction of the price. If you find a few pieces that you like but the frames don’t match your interior design theme you can easily pick up some new matching frames that will go with the rest of your home décor. There are a few other inexpensive items that will change the look of your home décor. You can find new comforter/sheet sets for your bedrooms and towels for your bathrooms at highly discounted rates online at bulk discount vendors like Overstock and Wayfair. You can also add new throw pillows to your beds and couches to match your new interior décor. Plants are a nice addition to your bathrooms, living room and family room spaces. You can choose either fake or live plants or a combination of both. Don’t forget to take into consideration that fake plants are better suited for bathrooms without windows or spaces that don’t receive much natural light. You can also hit up your local discount stores for various items such as vases, centerpieces and other odds and ends to add the finishing touches to your home décor. Now sit back and enjoy your beautifully updated home and celebrate the fact that you didn’t have to break the bank for it! Choosing a new shower? You might want to see these first! Exterior Design Ideas: How to Update Your Home on a Budget With simple changes and a little work, the outdoors can become a new area in which you can enjoy the lovely summer season. From fire pits and water fountains to backyard BBQs and landscaping, there are many ways to update your home for outdoor enjoyment. Read on to see how you can update the exterior on a budget. One of the most popular ways to add an outdoor feature to the home today is with a fire pit. A fire pit adds character as well as an area where you can relax and unwind at the end of the day. Fire pits can be created with materials such as stones and pavers or already constructed from iron material. Take a look at your backyard and see how you might could integrate a fire pit into your landscaping. Perhaps you have a small space where a paver patio could be created with a fire pit at the center. Consult with a Los Angeles remodeling contractor to find out how you can add a fire pit to your home. Is the exterior of your home looking a little rough? Is landscaping lacking in appeal or greenery? Sometimes adding a little mulch and greenery to the space will help the exterior of your home looks it’s very best once again. Stand in front of your home and take a look at what could be changed. Sometimes, just cutting back bushes and planting a few flowers makes the front of your home look so much better. Think of small changes you could make that will breathe new life into the first impression of your home. Another great way to create a relaxing space within your exterior is to add a water feature. This could be as small as a water fountain or a big as a swimming pool. All will be dependent on how much room you have to make any changes. Add a water fountain the front of your home for curb appeal. Add a swimming pool to the backyard for fun in the summer time along with creating a gathering spot for family and friends. Adding a swimming pool is not so budget-friendly but a great option if you have the space and the money to do so. Consulting with a Los Angeles remodeling contractor will help you to see just how much such a job would require as well as timeline for completion. Once you see the total cost for such a project, you might find that it is something you can afford and wish to see added to your home. Overall, you will find there are many ways in which you can update the exterior of the home to meet your backyard needs. Do a little sprucing up on your home or hire the professionals to handle big projects that will completely change the look and feel of your space. Flooring Remodel: What Choices do I Have? Flooring Remodel: What Choices do I Have? So, you have decided to remodel the flooring in your home, congratulations! You will find that new flooring adds character and charm to any home, allowing you to enjoy the space once more. If you live in an older home or a home where the flooring has not been changed in quite some time, you are certainly ready for a change. Flooring that is stained, ripped, damaged or has other issues can make your home appear dirty or even lower the value. To ensure your home looks it’s very best and has good value, it is recommended that flooring be changed out and replaced with quality materials. But which flooring type should you choose? It is important to weigh your options and find the right material for your home as well as budget. To begin, consider what type of flooring was in place to begin with. Did you have carpeting, vinyl or hard wood flooring? Do you want to repeat the same type of flooring that was in the home before or go with something new? Today’s trends for home flooring are to use the same flooring throughout the space. For most home owners, the most affordable choice is laminate flooring. This flooring type is a manufactured plank flooring that hooks together in a tongue and groove type manner and resembles the look of hardwood floors, but without the price tag. Laminate flooring is quite affordable and can easily be installed by a Los Angeles remodeling company. Your entire home can see new flooring in place within a matter of minutes with a professional installation, allowing you to enjoy the space quickly and for years to come. To be able to decide on what type of flooring to put in your home, you will need to ask yourself a few questions. What rooms will be getting new flooring? What type of flooring exists in the rooms of your home? Are you looking for something affordable and durable or want to install a more high-end material? Your budget should also be considered. Let’s consider that you are installing new flooring in the kitchen. This space is perfect for vinyl material, a very cheap option for flooring. Vinyl can be made to look like hardwood flooring and tile and comes in a variety of colors and patterns. By choosing this flooring type, you have a durable material for the home as well as an option that is affordable. With so many flooring choices to consider, it can be beneficial to work with a professional contractor for the job. You will be able to see sample types of flooring and learn more about how each type of flooring is installed, any warranty information, durability, affordability, etc. By learning more from the professionals, you can make a quality decision as to which type of flooring you will be placing in your home. Once the installation is complete, you will feel as if you have a brand new home. New flooring gives the home a new life and you may soon be inspired to make even more changes! Low maintenance is the correct word for these stylish fireplaces. You won’t have to shovel out coals and clean soot off of walls after every use. With any fireplace there is the concern for children safety, after all it is not called a fire place for no reason. Less safety concerns than traditional fireplace, wall mounted fireplaces can be installed out of children’s reach. You will always have to monitor when using any form of fireplace or equipment that puts off fire, and having a window cracked is recommended. But with wall mounted fireplaces you no longer have fire at the reach of little hands. With all the benefits and beauty of wall mounted fireplaces I see why they are popping up everywhere. Energy Efficient Remodels: Go Green! News headlines today about energy range from home solar panels and homes that generate their own power, homes that are energy independent and recycle rain water for personal use. 1. Satin brass. Say the word Brass and you instantly think of an old musty house with out of date fixtures. Say the word Satin Brass and you think of 2017! Satin Brass is more muted or warm than its brother polished Brass. You can pair any color of the rainbow with Satin or Brushed Brass, and this is one key that interior designers are loving. As the world is more driven to the technology side of life, there is a wave of voice-activated assistants to help out in the house. Amazon launched a device that allows you to ask “Alexa” what the weather is or to play a song from Spotify. The hunt is over for a premade vanity that fits your budget and space needed. Vanity conversions and upcycles are taking over. Many homeowners are finding vintage dressers or filing cabinets and remaking them into a custom vanity. This in turn saves money, the environment and creates a one of a kind piece that will never be seen in another home. Pantone’s Color of the Year is a must have green color . Use this bright green as an accent or as a focal point, to refresh or reconnect a space in your remodel. See our blog for Greenery tips. This green is a great back splash color believe it or not. 5. Splurging on laundry rooms. No longer are we seeing washers and dryers stuck in the garage. Machines that work as hard and as much deserve a luxury space to call their own. Home owners are creating elegant and chic laundry rooms in convenient places. Good Bye are the days of dragging laundry half way through the house. Opt for a custom laundry room to make this chore seem more like a hobby. Outdoor showers give you the feeling of being at one with nature, but in most places around the country this isn’t doable based on the seasons. Interior designers are changing this, and giving you the same feeling as an outdoor shower, inside your bathroom. To achieve this outdoor feeling, showers are being laid out in front of a large window that looks into a private garden or hillside. You can get special tint for your window if this still freaks you out on the privacy scale. Sneaky Ways To Make Your Cottage Seem Bigger Not everyone is blessed with a huge house, nor does everyone want one. When you have only a small amount of square feet to work with, your dreams of a remodel may seem far away. Truth be told, there are sneaky ways to make your cottage or small space seem bigger without major additions. The first thing you would want to consider when opting to create the feel of more space, would be an Open Floor Plan. Check if any walls could be removed to create a combination space like this eat in kitchen. In this Cottage remodel we removed a few walls that separated the rooms and made the area smaller, we combined the living space and the kitchen area to open up the floor plan and give the eye more room. Shoving furniture against the wall doesn’t guarantee a larger room. Try angling your bed or floating the sofa in the living room with a skinny console behind it. Breathing room around your furniture lends the appearance of more space. Buy furniture that fits your space and does not overpower the space. Extra large sofas are comfy, but shouldn't take up your whole room. When you are limited on space, light is your best friend! Give your small space a light color paint job, stick to pale colors such as white, cream, pale grays and blues to keep it light, airy and open. If natural light is not a possibility to be added in with new windows or doors, increase lighting with recessed lights or skylights. Skip the dark-inducing drapes and leave your windows uncovered. This will trick your eyes into thinking that your space has got depth — and reveal the natural landscape outside. If your room requires some privacy, try gauzy sheer white drapes for an airy feel that will keep prying eyes out. Take a look at a few of our completed projects on YouTube. Why hire a Los Angeles Contractor for your tile project? Plaster from the 15th century with 21st century appeal Just say it, “What the heck is Venetian plaster?” I knew you wanted to ask, because I was thinking the same thing. Venetian plaster is a technique for applying plaster not a type of plaster. Venetian plaster is a technique used to wall, ceilings, raised for curved surfaces to give it heightened stucco like appearance. This method of application was preferred by the craftsman of the 15th century in Venice, Italy, hence its name. The primary method for applying Venetian plaster to a wall involves using a trowel, putty knife, or spatula to apply the plaster in thin, successive layers that are allowed to individually dry before the next layer is added. The initial layers need to be thinner and smoother than later layers so that the plaster will adhere to the wall effectively over time. As additional layers of Venetian plaster are applied, the objective is not to create a smooth surface, but to work patterns and textures into the plaster that are maintained after it has dried. A final thin layer of Venetian plaster is applied to seal the surface imperfections, and, after this has dried, the surface is usually lightly sanded to polish it and remove any imperfections that could lead to chipping or cracking. The end result is a semi-gloss marbleizing effect where the plaster has subtle color and texture variations that change with lighting and different angles of view. As you read Venetian plaster takes time and a lot of patience; better to leave it to the professionals. But be careful: Though many companies currently market products claiming to be Venetian Plaster, few really are. Most are simply thick acrylic paints with silicates that mimic marble if applied in thin layers and burnished. Though having a similar appearance and finish to natural plasters, there are some key differences and the finish will not be the same. The great thing about Venetian plaster is the fact that it can be purchased Tinted or you can paint over the plaster. Venetian plaster adds a classic finish to your home; any room can get the look of Italian elegance. Contact Spazio LA today for a quote on your home remodel or Venetian Plaster project. Size has nothing to do with luxury!